So something really bugs me. We know from history that the current episcopal mitre predates the Ottoman Empire. Yet every online source we have says that the current Mitre did not predate it. Also, typically the statement is that it is the imperial mitre, which it is not, since the imperial mitre of the 15th century was drastically different from the episcopal mitre. When we see the relics of hierarchs from the 12th-14th century, we find mitres very similar to what we have today. So I know what you are thinking: this priest has a bee in his bonnet. Maybe, but the bee is that of historical ignorance. People find stupid things on the internet and then it gets cut and pasted over and over until it is "truth" on every website available. And we still, yes we STILL, in this age, have all those who from hierarchy to laity don't know that the epiklesis is NOT the 3rd hour prayers (and Lenten at that!) but rather the consecratory prayers, to the point in which we even still hear slavic priests and even bishops saying that the Greeks, Middle Easterners and Africans have "done away with the epiklesis"... sigh. And just as bad, there are "Greeks"--hierarchy to laity--who don't know that certain Slavic practices are older than modern Greek practice and even inherited from the Greeks in times past (the reverse is also true of different subjects, but the point is mutual ignorance and suspicion). What kind of a witness is this to those who are outside and looking into the legitimacy of the Orthodox Church? It is shameful. But yes, the very thing that prompted this thread is the very fact that there is not one source online that I have found that says something that is historically accurate on the subject of the mitre-the turban of the archierea. Can someone point me to at least one beam of light online that actually probes this to a real historical conclusion? We know that the Kamelavkion has existed since the 8th century (different forms in east and west, in the west more like the skufia, in the east more like the modern kamilavka), contrary to the claims of some here. I think people just generally say they used the crown mitre after the fall of constantinople because by then it was done basically everywhere, and besides what emperor is there to object? Well, it is believed to have belonged to Nikephoros Phokas (963-969). And yes, it did not arrive at the time of the Apostles. But you know that, and I never claimed that. I know that rounded tiaras belonged to emperors. That is not the point. The point is that bishops wearing them predates the date that is claimed universally on the internet. 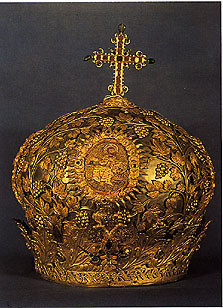 Most of the Byzantine crowns, however, resembled the MP's non-liturgical headdress (rounded coming down about the ears). BTW I am a professor. Well, I might not be a professor but I do happen to be the Queen of England. I could easily get my lackeys to fetch images from manuscripts which shows that the Palaeologid Emperors wore crowns that are identical to modern-day mitres. I might even look for those images myself if people want to see those images. Buckingham Palace is a big place and the lackeys like to hide themselves, so I guess that if people want to see it I'll look for them. I've always wanted to meet you. Is the tea in England as good as they say it is? I think Father is raising a fundamental problem we Orthodox have within our big, semi-dysfunctional tent. That is we don't understand, or accept, the true meaning of external traditions. In the pre modern era, minor differences in priestly garb, liturgical rubrics, headgear, chant etc.. really were unknown to the average cleric or lay person. Today, in our information hungry world, these long standing regional variants become points of discord among both the ill informed as well as leaders who should know better. For example, I am sure that Father has heard the complaint, from both Russian and Greek oriented Orthodox, the Ukrainian and Rusyn rubrics are some how not Orthodox in that they differ a little bit from post Nikonian Russian practice and post 16th century Greek practice. Yet, much of this predates the period of the Unia, and bears some structural similarity to the priestly old believer rubric. As we come ever closer to the yet elusive goal of North American "unity" it is important for all of us to learn more about the how, when and why behind such matters. If a yet to be established "central command" simply decreed a common mandatory rubric for North America without all of us gaining a fuller understanding of such matters, all hell will surely break out and the calendar fights of the past and present will seem quaint by comparison. We all need less "I heard" or "we do this or that" in order to move forward. ^Exactly. Another example is the complaint by some of the "shortened" Carpatho-Rusyn text of Liturgy and other services. Actually it is not "shortened," it was just never lengthened. It is identical to the Barbarini codex and to the early Rusyn codices. Instead of willy-nilly hack n' slash editing on the part of local editing, why not just use the preserved "shorter" version which was never cut as preserved in the Rusyn lands? Heaven forbid we go directly from the Great Entrance to the Kiss of Peace the way it used to be everywhere and the way it has always been in Rusyn lands. I think the issue is the approach that has been used over the last 50 years in Orthodox Academic circles. First off, those who are teaching this field of study are all going through an education process that at some point involves the Church of Rome, and I think that sets up the idea of liturgy from one source. Secondly, they approach it from a field of historicity rather than anthropological. Having studied both approaches during my undergraduate studies, our study of liturgical development deserves more of an anthropological study since it seems like many of our historical studies have gotten things very wrong. To understand the difference, the one who studies something historically will go visit a site (if they even bother to actually go and visit) and bring a book with them, and look at all the writings to make their conclusion. The one who studies something anthropologically will go to a site and study everything they can about the site and the people who are present around the site. They will observe, look for first hand accounts, and take a much broader approach to one single issue. They both may be studying the same onion. The historical approach is the cut the onion in half and look at all the layers together to see how we get from the core to the outer layer. The anthropological approach is to peal back each layer of onion and look at them separately, take each layer on its own merit. Each process has its advantages and disadvantages. It would be interesting to see the study of liturgy from an anthropological view. Perhaps I have found what my PhD pursuit should be. We know from history that the current episcopal mitre predates the Ottoman Empire. Yet every online source we have says that the current Mitre did not predate it. Also, typically the statement is that it is the imperial mitre, which it is not, since the imperial mitre of the 15th century was drastically different from the episcopal mitre. This 15th-century emperor is staring at you. "I know that rounded tiaras belonged to emperors. That is not the point." Clearly this crown is quite different in style from the bulbous mitres of St. Gregory Palamas. It is rounded with earbands, just as I stated above. Now back to the central issue. Can you find a single source on the internet on mitres that does not duplicate the claim that episcopal mitres did not predate the fall of Byzantium, or were simply a "transfer" of the (fallen) imperial crown? I agree with what you say. However, my biggest problem is the cut and paste method of putting forth information from website to website without any verification that the information is at all sound, and then people use this for study because, they reason, since it is universally cut and pasted, it must therefore be true. Exactly, and it is not bothersome until you have a whole fleet of students who do papers on a subject and then, instead of quoting real books, they are quoting internet sites. Or, worse yet, you have a meeting where certain important ecclesiastical matters are being decided, there is a disagreement, and someone looks up the subject on the internet on their phone (rather than delving into real sources), and that "decides" the matter. ^And that is only slightly superior to those who make crucial decisions without looking up or verifying anything at all. Imperial regalia passed to the Ecumenical Patirarch first and gradually out to other bishops until all bishops wore them. We see this with the sakkos and epigonation, so it would stand to reason that the mitre followed the same pattern. Could it not be possible that prior to the Ottomans, the Ecumenical Patriarch and some senior archbishops like those of Thessalonika had use of the mitre and it did not become common for all bishops until after. When did bishops start to appear in iconography with mitres as opposed to bareheads? I remember in my reading one of the complaints the Greek bishops at Florence had was the Latins celebrated Liturgy with mitres while the Greeks celebrated humbly in bare heads. Now there is a real church dividing issue for you. In all seriousness, though, even with your arguments, the initial point remains the same, that the widespread internet claim that bishops did not wear mitres prior to the fall of Constantinople is not true. Although I seem to remember that the argument was that they celebrated the oblation with head covered was the complaint. It was St. Symeon of Thessalonica who pointed out that only the Pope of Alexandria by an ancient custom wore a mitre during the anaphora, the rest of the patriarchs and bishops went bear-headed. The Epigonation is earlier, however. 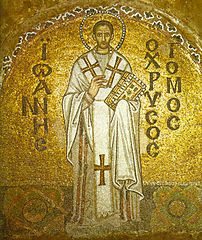 It is mentioned in the early Liturgy of St. John Chrysostom, and is mentioned in letter from Patriarch Peter of Antioch to Patriarch Michael Kerularios. It pre-existed the move from phelonion to sakkos (which some argue is a cross polination from Latin practice of the dalmatic and revival of earlier eastern practice of varient dalmatic, and others argue is an imperial move, but still existed by the 11th century). With regard to the sakkos, some have argued on this front, which came first, the chicken or the egg? It is possible that the imperial sakkos came as the result of the emperor adopting, by special ecclesiastical status (as with many other things), the adoption of the new vestiture of the bishops, or at least of senior bishops. Either way, it does not matter. The point is that our modern internet sourcing is horrible and spreads lies. ^BTW, I forgot where I read it, but there was one iconographer who argued that it is wrong to represent anyone but Christ in the mitre iconographically, that Bishops should always be represented bear-headed yielding the portrayal of great high priesthood to Christ. Would be interested to hear LBK's input on that. It's interesting to see information contrary to what is espoused as indisputable truth online about these subjects. Because the icon is late. I see you are also guilty of spreading false information. You has said twice now that bishops should be "bear" headed. This would be a heresy (and a new one at that) so you could be called a heresicarch (congrats). It would be inappropriate to depict a bishop with a "bear" since they tend to be scary, well except for maybe the Panda, and the Polars are cute in the Coca-Cola commercials. "Bear" has a completely different meaning then "bare" which is the word I think you are meaning to use. That is cold. As would be a bare head in cold Ukrainian climes. Right, hence the statement which followed "but seriously." Actually, I never said that bishops should be bear headed or bare headed, I said that the iconographer said it. I personally am not invested whether they have a mitre on or not, but would like to know LBK's opinion on it. Probably not the animal that was the spelling slip, but the spelling error is amusing as I hope that all Bishops are bearing heads in iconography, as headless bishops would be frightening to most of the faithful. But I didn't even mean bare-headed, but rather mitreless, as there was nothing mentioned against klobuks or anything, just mitres (the view was the Christ alone be presented as mitred great high priest). So far, all I have received from this thread is that we need an emperor again. And he should take his chair back. Sorry if it sounded like I was claiming you thought they were from the apostolic era!! And sorry I did not really get your point in my first reply, I did not really understand the OP. One part was about crowns another about something with the liturgy. I will speak more some other time about the emperor's crown (I need to sleep, and it takes a long time to find all those old byzantine gifts to european monarchs so long ago which depicted the emperor...) but I think it is fair to say at least that the crown was not used in Russia even after the fall for quite some time... not even during the time of the Nikon Reforms were those crowns used in Russia. Also claimed is that the internet is universally saying that the crown was not used by bishops before the fall. I do not think the internet hardly has any sources at all on this subject, it simply is not well researched at least in the english language. Of course this is no good in our modern era, where students simply use the internet for everything, using wikipedia sources as sources... googling and sourcing whatever comes up! but what can they do? Google scholar will be empty! The library is not going to have anything on it! They will probably need to learn Greek, go to Greece, attend some fancy university, and then they might hear the truth as to when these crowns really first started! When I said professor, I meant a professor who is an expert in this subject ;P but I did not know you are a professor! Αλλ’ η σημερινή μίτρα του επισκόπου κατά πολύ απέχει τόσο από την παλαιά (αρχαία) όσο και της παλιοχριστιανικής περιόδου. Μίτρα στην θύραθεν και στην εκκλησιαστική γραμματεία εκαλείτο, αρχικά, μια απλή ταινία υφαντή, από δέρμα ή από έλασμα που περιέβαλε την κεφαλή για την συγκράτηση της κόμης, θα έλεγα ως ένας ιμάς-κεκρύφαλος. Με αυτήν την έννοια την αναφέρει ο π. χ. Ευριπίδης στις Βάκχες, 833, («ἐπί δε κάρᾳ δ’ ἔσται μίτρα) και στην Εκάβη, 924. Επίσης ο ελεγειακός Καλλίμαχος στον «ὕμνο εἰς Δῆλον», 166 κ. ά (Πρβλ. και λατ.capitta ligamentum, ιταλ. Beretta κ. ο.κ.). Στους Ελληνορωμαίους άρχοντες απέκτησε κάποιο διάκοσμο και έγινε διάδημα. Συνήθως το έφεραν βασιλείς και αξιωματούχοι. Είναι οι «διαδεδεμένοι την κεφαλήν» κατά τα βυζαντινά κείμενα. Το διάδημα-μίτρα ήταν πολλάκις ακτινωτό και χρυσό, και των βασιλέων αδαμαντοκόλλητο (ως π. χ το ακτινωτό του Ιουστινιανού), το φορούσαν δε ή απευθείας στην κεφαλή, ή στην βάση του σκούφου, (συνήθως ερυθρού). Σιγά-σιγά όμως το έλασμα- μίτρα ενώθηκε με τον σκούφο και έγινε η απαραίτητη βάση του. Αυτό τότε το βασιλικό στέμμα και η μίτρα περίπου (βλ. την μορφολογική της σχέση με τα περίκλειστα θολωτά βυζαντινά βασιλικά στρέμματα, μετά τον Ιουστινιανό (6ος αι.) και κυρίως της περιόδου των Μακεδόνων, Κομνηνών και Παλαιολόγων). Όταν, τώρα, μετά την Άλωση ενώθηκαν στο πρόσωπο του Εθνάρχη Πατριάρχη τα δύο αξιώματα (πολιτικό και εκκλησιαστικό) και ο αρχιερέας ονομάστηκε και Δεσπότης (με αρνητικές συνέπειες αυτού του τίτλου) , πήρε τότε και το πλούσιο βασιλικό στέμμα τη θέση της, ως τότε, απλής, ή με σκούφο ενωμένης μίτρας. Το απέκτησε βέβαια ο Εθνάρχης μαζί με τον πολυποίκιλτο βασιλικό σάκκο. Αυτά, στη συνέχεια, τα απέκτησαν και όλοι οι αρχιερείς, για να καταλήξει αργότερα το αρχικό σεμνό διάδημα στην υπερ-υψωμένη, συμπαγή, με πολύτιμους λίθους και εικονίδια κοσμημένη μίτρα ως, κατά κάποιο τρόπο, συνέχεια ( ; ) της μίτρας της παραδόσεως. Αλλ’ όπως τελικά διαμορφώθηκε, υπενθυμίζει, εκ πρώτης όψεως, την Ασιατική κίδαρη (τιάρα) και κυρίως την υψηλή ημισφαιρική και διάλιθη Ασσυριακή, αν και δεν προέρχεται άμεσα από αυτήν, όπως προείπαμε (4). Μάλλον όμως προσεγγίζει σε ορισμένα δυτικά βασιλικά στέμματα, που βέβαια επέδρασαν αρχικά και διαμόρφωσαν και την μίτρα της Ρωσικής Εκκλησίας. Και ως είναι γνωστό, το Οικουμενικό μας Πατριαρχείο (με Πατριάρχη τον Ιωάσαφ Β΄) παρακάλεσε τον ρώσο τσάρο, το 1557, να του αποστείλει μίτρα. Αλλά δεν έγινε επειδή στο μεταξύ απέθανε ο Ιωάσαφ. I know. Mods should put this thread to death, and dig up the emperor and put him on his throne and put all of the bishops' mitres on his head. Thanks for the article. It is brief but at least is something different than the typical cut and paste stuff found elsewhere. Are you saying that the mitre was not used in Russia until after the Nikonian reforms? You will have a tough time convincing the Old Believers of that. I recall a famous "Isa oc.net special" picture depicting an exhumed Pope holding court so why not? I made the mistake of naming the subject "miter or mitres," as the topic is wider (podkarpatska understood the broader point). Nevertheless, it is good that I did so. I will tell you where this all came from. Several priests that I have talked to have stated the popular opinion that "we have got to stop dressing our Bishops up like the emperor and singing the emperor's chant (eis polla eti despota) to them." The reason given is that, if all this started with transferring the emperor's prerogatives to the bishop at the fall of Constantinople, then we should cease doing it, immediately. My point is that I am not convinced that this is the case. Sooooo, let us say that I am wrong, that indeed, all of this started with the fall of Constantinople. I assume that Gunarr and Cyrillic, our two young feisty 'converts' on this thread, agree that it should be done away with. Otherwise, how can you defend its continued use? If it is the case as both of you said, it is wholly unecclesial. lol. "Isa oc.net special" should be trademarked. Afterall, our bishops are not mere "men", but, are anointed to lead Christ's Church, no? When we approach the bishop and ask his blessing, are we expecting the "man" in the fancy robes to have some super duper powers that he will wave his hand over us, mumble something and make our lives all happy? No. We ask him, but, through him, we anticipate Christ's blessing. While Christ came to serve, and did not wear "fancy" clothes, that's because He came to teach us, to show us the way, of how we ought to behave, dress, speak, etc. The bishop, to me, has the Holy Spirit working through him (as do our clergy), more-so, than via laity. He is our "leader" and as such, ought to be distinguished from the rest of us. If Christ, any one of His Saints, or His anointed bishops, were to show up on my doorstep, I would feel it necessary to dress them in the finest clothes I had, feed them the best food I had, give them everything of the best that I could give them. No? It would be an honor to do so. Same with our church buildings. Christ was born in a shepherds cave. He never lived on earth in a palace. He often slept under the stars. However, now that we "can", we build lovely churches. These churches are better decorated than our homes, because our homes are merely ours, but, the church, it is set aside as God's house. We decorate it in order to distinguish from any other buildings. Not only does the manner of decoration, the gilding, the rugs, etc. make it "pretty", when we walk in we immediately realize we are someplace special. In other words, the "fancy" decorations are to set the Church and her Bishops (clergy) apart, so that we realize that they are special, because they truly are. We are not all called to be priest, nor bishops. We ought to honor and revere all things set aside by God, for God. Besides, do not we also put on our "Sunday best" when we go to church? Why shouldn't our clergy do the same? Why should not the successors to the apostles wear a mitre, if the apostles wore them? I think those who are "against" such things, are just jealous because they don't get to wear them. I know I was tickled when I got to hold the bishop's staff. I learned what a jezel (sp?) is. So unless a specific type of headgear has been worn by the apostles it is 'unecclesial' and should be done away with? If anyone is feisty it isn't me. I don't care what you think about crown-shaped mitres while you think those crowns important enough to hurl ad-hominems over. One should be able to expect better from a professor and a priest. There is a difference between decrying something as wrong and deciding it is time to lay something aside. Pope Paul VI did so with the papal tiara. He did not say future popes should not use it but they have followed his lead. Apparently, the work of sanctification can be laid aside whilst we argue over dress. I don't really know if that mitre on top of St. Gregory Palamas' sarcophagus was his. The icon on it definitely isn't from the 13th/14th Century because it's a westernized icon. Also, the mitre doesn't look old, but quite recent, no older than 250 years. It's like that icon supposedly painted by St. John of Damascus, which we actually are sure dates to the 14th or 15th Century, but could be a re-painting of the original. We don't really see icons/images of Bishops with mitres until about the 15th/16th Centuries. However, we do see Emperors/Empresses depicted with them. I've always been amused by the experience of an Indian priest when attending a hierarchical liturgy in the Russian tradition. Describing it to some colleagues, he marveled at the elaborate vesting ceremony, the wonderful music, the fluidity of the movements, etc. But one major complaint of his was that much of the Liturgy of the Word was given over to "bishop worship" in the form of those very same imperial chants, crowns, etc. In Syriac tradition, we have chants for when a bishop solemnly enters or exits a church before or after services, but that's about it (if he walks in as a service is in progress, he just walks in without any fuss). During the Liturgy or any other divine services, there's nothing like what the Byzantines have for their bishops: the only things that mark a bishop are the distinctive vestments (the omophorion and the "mitre", which is really a type of veil) and insignia (crosier, hand-cross, panagia). I don't know if the other Oriental traditions have anything like what the Byzantines have, but my limited experience leads me to suspect that they don't. There are certainly differences in how a bishop serves as opposed to a priest, but it's not as developed a distinction as in the Byzantine rite. For us, a bishop serves, for the most part, like a priest (or more properly, a priest serves like a bishop, but without a few episcopal elements). That difference always led me to believe the standard line that the fall of Constantinople had something to do with the Byzantine adoption of imperial customs for the bishops. If it was earlier, why wouldn't we have it? Even the Chalcedonian schism didn't prevent, for example, the Syrians from incorporating some of the poetic canons written by John of Damascus into our liturgical services. Hardly a scientific observation, but an observation anyway.